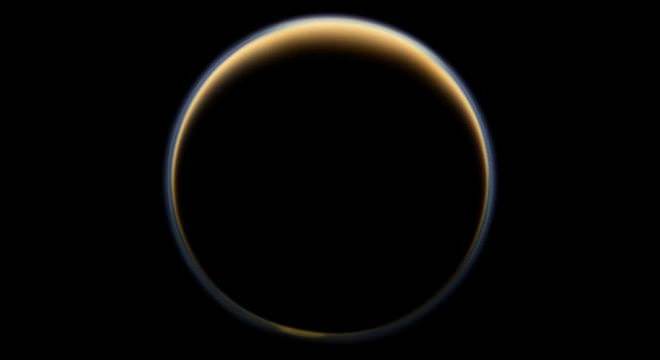 With its dense and hydrocarbon-rich atmosphere, Titan has been a subject of interest for many decades. And with the success of the Cassini-Huygens mission, which began exploring Saturn and its system of moons back in 2004, there are many proposals on the table for follow-up missions that would explore the surface of Titan and its methane seas in greater depth. The challenges that this presents have led to some rather novel ideas, ranging from balloons and landers to floating drones and submarines. But it is the proposal for a “Dragonfly” drone by researchers at NASA’s JHUAPL that seems particularly adventurous. This eight-bladed drone would be capable of vertical-takeoff and landing (VTOL), enabling it to explore both the atmosphere and the surface of Titan in the coming decades. The mission concept was proposed by a science team led by Elizabeth Turtle, a planetary scientist from NASA’s Johns Hopkins University Applied Physics Laboratory (JHUAPL). Back in February, the concept was presented at the “Planetary Science Vision 2050 Workshop” – which took place at NASA’s headquarters in Washington, DC – and again in late March at the 48th Lunar and Planetary Science Conference in The Woodlands, Texas. ASA’s Cassini spacecraft looks toward the night side of Saturn’s largest moon and sees sunlight scattering through the periphery of Titan’s atmosphere and forming a ring of color. Their proposal is based in part on previous Decadal Surveys, such as the Campaign Strategy Working Group (CSWG) on Prebiotic Chemistry in the Outer Solar System. This survey emphasized that a mobile aerial vehicle (i.e an airship or a balloon) would well-suited to exploring Titan. Not only is Titan the only known body other than Earth that has a dense, nitrogen-rich atmosphere – four times as dense as Earth’s – but it’s gravity is also about 1/7th that of Earth’s. However, balloons and airships would be unable to study Titan’s methane lakes, which are one of the most exciting draws as far as research into prebiotic chemistry goes. What’s more, an aerial vehicle would not be able to conduct in-situ chemical analysis of the surface, much like what the Mars Exploration Rovers (Spirit, Opportunity and Curiosity) have been doing on Mars. As such, Turtle and her colleagues began looking for a proposal that represented the best of both worlds – i.e. an aerial platform and a lander. This was the genesis of the Dragonfly concept. The mission is also in keeping with concepts that Turtle and her colleagues – which includes Ralph Lorenz (also from JHUAPL), Melissa Trainer of the Goddard Space Flight Center, and Jason Barnes of University of Idaho – have been exploring for years. In the past, they proposed a mission concept that would combine a Montgolfière-style balloon with a Pathfinder-like lander. Whereas the balloon would explore Titan from a low altitude, the lander would explore the surface up close. By the 48th Lunar and Planetary Science Conference, they had officially unveiled their “Dragonfly” concept, which called for a qaudcopter to conduct both aerial and surface studies. This four-rotor vehicle, it was argued, would be able to take advantage of Titan’s thick atmosphere and low gravity to obtain samples and determine surface compositions in multiple geological settings. In its latest iteration, the Dragonfly incorporates eight rotors (two positioned at each of its four corners) to achieve and maintain flight. Much like the Curiosity and upcoming Mars 2020 rovers, the Dragonfly would be powered by a Multimission Radioisotope Thermoelectric Generator (MMRTG). This system uses the heat generated by decaying plutonium-238 to generate electricity, and can keep a robotic mission going for years. This concept incorporates a lot of recent advances in technology, which include modern control electronics and advances in commercial unmanned aerial vehicle (UAV) designs. On top of that, the Dragonfly would do away with chemically-powered retrorockets and could power-up between flights, giving it a potentially much longer lifespan. Currently, NASA’s Jet Propulsion Laboratory is developing a similar concept. Known as the Mars Helicopter “Scout”, for use on Mars, this aerial drone is expected to be launched aboard the Mars 2020 mission. In this case, the design calls for two coaxial counter-rotating rotors, which would provide the best thrust-to-weight ratio in Mars’ thin atmosphere. This sort of VTOL platform could become the mainstay in the coming decades, wherever long-term missions that involve bodies that have atmospheres are called for. Between Mars and Titan, such aerial drones could hop from one area to the next, obtaining samples for in-situ analysis and combining surface studies with atmospheric readings at various altitudes to get a more complete picture of the planet. I think may be posible to make an liquid-capable dron, to also don’t lost the posibbility of study lakes !! !